We needed a way to share the events with those in the community (Warrenville and nearby), so we created a Facebook group. This is a public group, so anyone who is invited, who has the link, or who stumbles across it is free to join us. 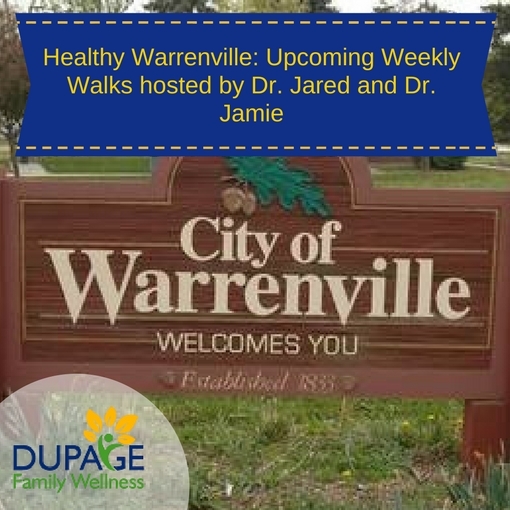 As events come onto our radar, we will post them on our Healthy Warrenville Facebook Group. I invite you to join this group, so that you can take advantage of these events, get healthier, and have fun in the process! Once you are a member, feel free to share it with friends and family who you think might also be interested. If you aren't on Facebook, you can also stay up to date with local events by subscribing to the newsletter "This Week in Warrenville", Sign up at warrenville.info, and events will come to your inbox each week. If you are hosting or hear about an event that you'd like to share, you can post it on the facebook page as well. The more I learn about health, the more I learn that "community involvement" and "relationships" are crucial factors for good heath. What a better way to get involved in the community and form real relationships with other like minded people. My husband Jared and I decided to host a "Weekly Walk with the Docs" in order to meet people in the community, as we move our bodies. Starting on Monday April 23 at 9:00 am, my husband Jared and I are going to host a weekly "Walk with the Docs" event. Come out and join us! The more the merrier. This will be every Monday morning at 9 am. We will meet at the gazebo near the prairie path (across from the Warrenville Libary). We will take a quick break around mid May-early June as we are settling in with the new baby, and then the Monday morning walks will resume. If you are in the Facebook Group, you will be able to see any last minute updates or changes to the schedule. If you live locally, join us so we can improve our health as individuals and the health of our city!